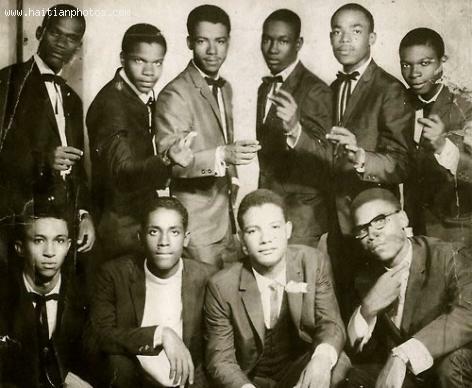 Here is a picture of the group Tabou Combo when they just started playing together. This picture came from one of their earliest music albums. In this picture, you see the members seated from Left to Right: Paul Gonel in accordion, Serge Guerrier as vocalist of the band, Albert Chancy the lead guitarist and also band leader, Yvon Ciné in the bass. On the other hand, Standing from Left to right, we see: Roger Eugène alias Shoubou as vocalist, Yvon Andre in the percussion, Adolphe Chancy in bass, Yves Joseph in the percussion/drums, Herman Nau in the trap-drum, Jean-Claude Jean, Alias Kòk, playing 2nd guitar.